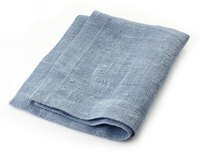 Natural fibers are ideal for making cloth napkins, with linen and heavyweight, woven cotton standing out as the two best choices. All you need to turn the raw cloth into finished napkins is a serger or a sewing machine. There's a reason so many fine, older napkins were made of linen: It's easy to wash and generally washes clean but is still an absorbent natural fiber. Linen also wears extremely well, which means it can stand up to years of heavy use and repeated washings. Napkins made of hemp linen also work very well. Knit cotton fabric may be ideal for cleaning rags, but woven cotton's sturdy-yet-absorbent texture is usually best for napkins. Choose cotton that's sturdy enough to stand up to frequent use and lots of washings, but not so rough that you wouldn't want to wipe your face with it. Quilting cotton works well for making double-sided cloth napkins, or choose a heavier-weight fabric if you want to make single-layer napkins with serged edges.